Tuesday, 05 May: Of Nadirs, Nemo and Naughty Acid Treats. ‘I wake and feel the fell of dark, not day. I’ve quoted Hopkins because his lines so exactly capture how I feel, waking before dawn, even though I’ve had a relatively good night’s sleep (some delay in getting off because of nagging kidney pain – as if it’s triumphantly reminding me that apricot kernels have nothing to do with it) – but only one piss / turn of duvet. First thing on my mind is getting a referral to the Royal Marsden. That’s easy enough from what friends tell me and what I read online. The problem is getting one of the specialists to take you on. As a world-leading centre, everyone wants to be treated there, and the demand is just too great to satisfy. I devise a cunning plan. Once I’ve found out when I can be referred, I’m going to go to the RM and leave a personal letter for one of the two lung specialists whose names come up time and again. How to distinguish myself from the jostling crowd? 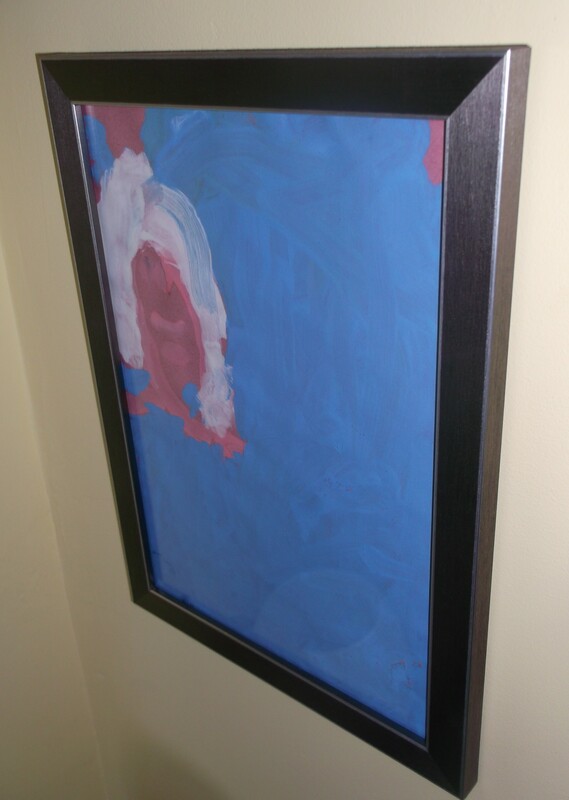 An older dad, with a three-year-old daughter, please, I beg you, take me on for her sake, not for mine. I’ll enclose a photo of us together. If Maddy’s lovely little face doesn’t do the trick, I don’t know what will. Then I burst into the heaviest bout of sobbing I’ve had since all this began. I’ll be begging someone for my life, just put the end off as long as you can, please sir, for my daughter’s sake. And for another reason which I can’t tell any of you dear readers about just yet. Why am I so upset? Because, if I’m a realist, Maddy will spend the vast majority of her life without me. If I enjoy the average time for people with my diagnosis (kidney, lymphs and lungs), I’ll have 30-40 months from now (it might be a lot less, or possibly 20-30 months more than that). That means that, if I conform to the statistical median, when I bow out she’ll probably be six, at most seven. Of course, I’ll make it to her graduation day (! ), but lying in bed, watching the first pales shimmers of dawn light the sky, I can’t help also being realistic. Far darker follows. I begin to think that it might be better for Maddy’s sake, cause her less long-term psychological damage, if I don’t try to cling on as long as I can. She’s so little still. But the more conscious and aware she becomes, the more my departure, whenever hat happens, is going to hurt. A major reason for my not having had children before I did was the long-term consequences of the trauma I went through after losing my father at the age of twelve. I just couldn’t face the possibility that any child of mine would one day have to go through anything like that. It was only after many stages of coming to terms with what happened, sealed by my trips to India in 2007-08, which I wrote about in The Setting Sun, that I finally felt fully liberated from the burden of dad’s premature death. And now here I am, in exactly the situation I spent most of my life trying to avoid. So, whatever he suffers, Hopkins’s God is always with him, however seemingly difficult or peremptory His demands. I’m not a Christian but I’ve always liked to think of myself as spiritual in some strange sort of way. Where I part company with conventional religion is on just this question of the suffering of the innocent. If the Christian God, Allah, Brahma, Jehovah created us, how can they allow Nepal, the Mediterranean migrants, the suffering of Gazans; and, the flip side of that, allow the corruptly powerful to enjoy the fruits of the earth, whether sanctioned and forbidden, with apparently complete impunity? History has proved we humans far too weak to break this never-ending pattern. Why the hell haven’t any of the Creators stepped in, if they are Compassion, Love etc. In the days when I toyed with following the religious path (and I once did), it was the failure of all my notional spiritual guides to answer this question with a shred of convincingness (is there such a word?) which set me on the one I’ve followed. It takes Anna a long time to calm me down once she’s rushed round from dropping Maddy at nursery. But, ‘of the right kidney,’ steady and strong, as well as deeply sympathetic, she does. Even if the worst comes to the worst, which it won’t, she insists, things will be totally different for Maddy than they were for you. First of all she’s part of a very strong and loving extended family who all adore her. You didn’t have that. Secondly, the world has changed radically. No-one has to suffer in silence, buttoned up, like the war-generation your mother belonged to, leading to her long years of depression. If necessary, Maddy will have a whole range of counsellors, at school and outside, to help her express her feelings and her grief, fully and openly. I nod. It suddenly hits me. Is my recent turn to life-writing – including this blog – a reaction to that stiff-upper-lip, chin up old bean, culture of repression which almost stifled me in my teens? I think back to Stew’s funeral and the beautiful loop of video of his family life which played throughout the reception afterwards. He was there with us in a way unthinkable in the 1960s. Of course it’ll be tough for both of them, Anna concludes, when and if the time comes, but she’s not going to break, nor Maddy go off the rails at school or turn to drugs. I feel much better by the time Elena Bennett stops by to drop off some food for me. Hearing that I’m back on animal protein, she’s made something I haven’t tasted for decades – beef casserole. And it’s accompanied by two fresh salmon steaks. And then she’s off, as nonchalantly as if she’s doing the same thing all over Battersea, no need to make a fuss thanking her. But I must and do so here. Soon after, a friend comes to take me out for lunch. For reasons I don’t fully understand, she’s asked me not to name her, so I’ll call her Nemo just to help the flow. I’ve known Nemo for years and she’s one of the people I feel closest to. She asks what I want to do and I suggest maybe a walk, somewhere nice, and lunch. She knows he’s one of my favourites, of the generation of Piper and Bawden and Gill, so I take little persuasion. Soon we’re skimming round the South Circular to Dulwich, which I’ve always found a peculiar area, stuffed with elite schools, seemingly in the country, inaccessible despite its closeness to Clapham Junction unless you have a car. It proves a good choice, however, the lovely scents of early wisteria and lavender, the white and red candles gathering on the chestnuts along the park, my favourite trees. I used to visit Dulwich when my friend Hilly lived here. Her painter father, Alfred, a close mate of Dylan Thomas, and his wife Mary were always so welcoming, humble about their accomplishments and ever-interested in what the next generation thought. 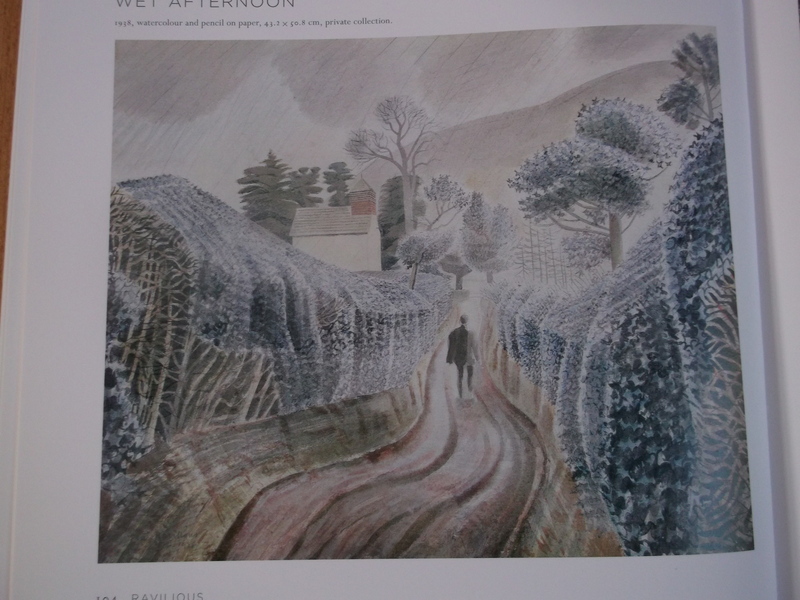 I wonder if Fred knew Ravilious? They were only a few years apart at art School and some of Fred’s scoring techniques in his 1930s output resemble, in exaggerated form, one of Ravilious’s most distinctive painterly gestures. But first it’s lunch at the Dulwich Picture Gallery cafe. In homage to my need to build myself up, I have duck confit; and I follow up with clafoutis, accompanied by a scoop of vanilla ice-cream. Wow, it may be naughty, it may be acid, but it all tastes so good after alkali for five weeks! Nemo and I discuss things at length. Where I’m at now, what lies ahead, how she’s reacted to my news, her life, her family (her son’s sent me a beautiful get-well card), her work. It’s all intimate, honest, nourishing and fun, though I sense that my voice is growing fainter as the chat goes on. 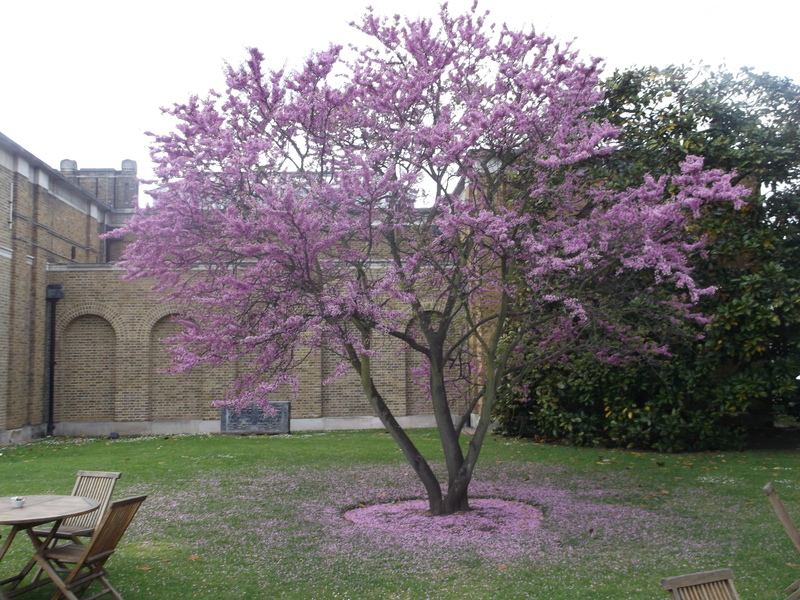 Lunch done, we head to the gallery, past the most beautiful Judas tree. May’s always been my favourite month, the natural world so abundantly picking up its stride, the scents and a promise of long, long months of light and warmth. It’s not just Ravilious I’m interested in. 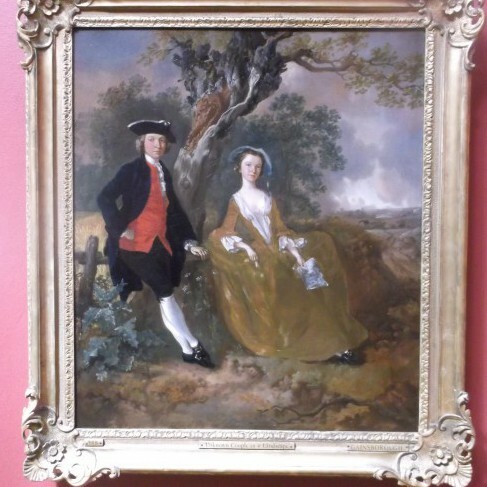 The DPG has several Gainsboroughs. Anna and Maddy are direct his descendants, though for the life of me I can’t understand why Anna and her immediate family aren’t more interested in him – or some of the other family luminaries who fascinate me. 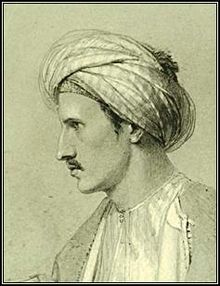 These include Edward Lane, author of the ground-breaking work of Orientalism, Manners and Customs of the Modernern Egyptians and a translation of one of my favourite books, The One Thousand and One Nights. Then there’s Anna’s grand-father, former Master of Balliol, J.V. Poole. His contribution to the Oxford history of medieval Britain, From Domesday to Magna Carta, 1097-1216, is a masterpiece in my opinion, even if it’s now been superseded. What I particularly like his sly wit (it’s worth reading just for Poole’s account of how he deduced that William Rufus was gay.) Imagine spending your whole academic career mastering a nineteen-year period of history to produce your single monument to posterity! Poole wouldn’t have lasted a minute in today’s University REF environment, with its demand for a hack monograph every five years, leading to the vast over-production which nobody, with the best will in the world, has the time to get on top of. Then it’s Ravilious. Anna’s grandmother Catherine owned one, which is how I first got interested in him. He was an Official War artist and painted some of the most haunting images of the war before dying at the age of 39, his plane going down into the frozen seas off Iceland. His work is enigmatic; it has elements of Blake and Samuel Palmer, especially the engravings; hints of surrealism; a relative absence of human figures; a preponderance of pale pastel colours; and a strangelydecorative streak. When Nemo asks me which is my favourite, I answer without hesitation. ‘A Wet Afternoon.’ I love the rhythms in the landscape and the perspective. Only later does it strike me there might be another reason. The figure is on a solitary journey, headed towards the church(yard.) Is this an objective correlative for how I feel, a week exactly before my op? And when I buy the catalogue, I’m afflicted by a strange feeling. Is it a pointless purchase which someone will soon put aside and forget amongst the thousands of other books I own? Nemo drops me off at tea-time. I feel thoroughly nourished by the outing but, as usual after any sort of social engagement tired but tired. Catching up with emails, I find more exceptional kindness. A colleague has written to offer her cottage by the beach in Broadstairs if I want somewhere to convalesce. The day’s turned full circle this from morning. I go to bed and listen to some meditation music. I’m as calm going to sleep as I was agitated when I woke. How did I allow myself to get in such a state? This time in a week I’ll be starting to mend, taking my first step on that long, long road, through many wet afternoons, to Maddy’s graduation.